Car window decal used for outside application. Size: 7" x 3"
Car window decal used for outside application. Size: 7.5" x 2.5"
'Split Y'' car decal half in green and half in white. Size: 4.5" x 3.5"
Celebrate your school spirit by showcasing your favorite York College of Pennsylvania memories with a unique, photo frame! Our industry-exclusive, state-of-the-art printing process provides vibrant color and added dimension to the York College of Pennsylvania word-mark. It is framed in Barnwood moulding crafted of 100% recycled wood and mimics the appearance of reclaimed wood with a distressed finish. Holds a 5"x7" photo. Celebrate your school spirit by showcasing your favorite York College of Pennsylvania memories with a unique, photo frame! Our industry-exclusive, state-of-the-art printing process provides vibrant color and added dimension to the York College of Pennsylvania word-mark. It is framed in Barnwood moulding crafted of 100% recycled wood and mimics the appearance of reclaimed wood with a distressed gray finish. Holds a 5"x7" photo. 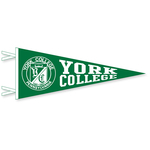 12" x 30" wool felt pennant featuring the York College of Pennsylvania seal. 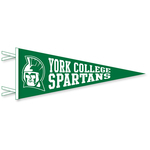 Wool felt pennant featuring the York College of Pennsylvania Spartan. Wool felt pennant featuring the York College of Pennsylvania seal. 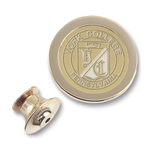 Gold lapel pin featuring the York College of Pennsylvania seal. Money clip available in Silver or Gold featuring the York College of Pennsylvania seal medallion. Includes pouch and gift box. Palm desk clock with the York College of Pennsylvania Seal. Silver charm featuring the York College of Pennsylvania Charm. Silver-tone plated York College of Pennsylvania Seal pendant with 18" "perma" silver plated chain. 3/4" diameter pendant. 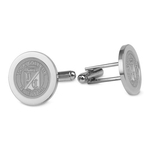 Silver cufflinks with silver york College of Pennsylvania seal medallion. Includes pouch and gift box. Split-wire key ring featuring the York College of Pennsylvania Seal. "Parent'' in white with york college seal in green.